New sports network Fox Sports 1 reviewed. The launch of a new sports network is not without its speed bumps. Charissa Thompson, Donovan McNabb, Andy Roddick, Ephraim Salaam and Gary Payton on Fox Sports Live. Fox Sports 1, Fox’s well-funded, fully stocked, wannabe ESPN-killer, began airing this past Saturday morning. As Curt Menefee appeared on-screen to deliver the fledgling network’s mission statement, the ticker crawling across the bottom of the screen flickered to life. “Our promise to you is we will share your passion for the game, never take ourselves too seriously, and most importantly, never put ourselves before the game or the athletes,” Menefee said, as the ticker displayed NASCAR’s Pure Michigan’s 400 lineup. Can a sports channel be a sports channel if it doesn’t use every single pixel of screen space to share inessential information with its viewers? 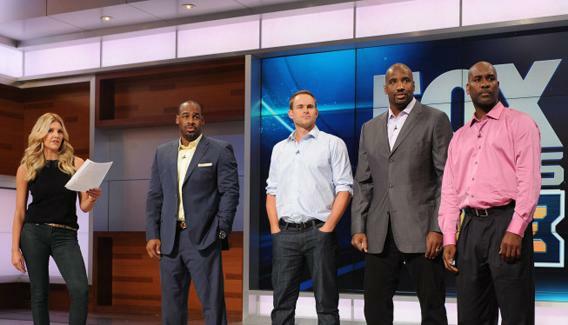 FS1 may be new, but it’s not going to be the network that finds out. FS1, using the power and pocketbook of the Murdoch empire, has what no wannabe ESPN rival has had in the past: big-time sporting events. (Or, it will. Right now, it has the very popular UFC bouts and a first-night champ who, in honor of FS1’s premiere, orated a trash-talk poem that would have made a professional wrestler proud.) In the run-up to launch, Fox claimed FS1 would have a different attitude than ESPN, a ”jockularity” distinct from that network’s stat-happy wonkiness. This greater sense of fun would, allegedly, be best showcased on Fox Sports Live, FS1’s nightly answer to SportsCenter, hosted by two improvising Canucks, Jay Onrait and Dan O’Toole. But in their totally competent weekend debut, the pair failed to come up with even one good joke about Mark Sanchez’s experiments with pirate facial hair, a comedic freebie if there ever was one. Three days in, “jockularity” remains a portmanteau, not a reality. Launching a 24-hour network in sports’ sleepiest season and being perfectly passable is no small accomplishment, but still, everything on FS1 is acceptable without being remarkable. Fox Sports Live is nearly indistinguishable from SportsCenter, except that its scroll of superflous information—this day in sports history!—runs down the right side of the screen and not the left. Onrait and O’Toole do a solid Olbermann and Patrick impersonation, but the most interesting part of their shtick is their Canadian pronunciation of the word “Out,” which, for a limited time only, turns every baseball segment into a nationality crisis. Will Americans accept their baseball news if it’s delivered by a Canadian?? Onrait and O’Toole are doing what they can to squash their native vowel sounds, so in a week or two, no viewer will be prompted to ponder this question. Roddick has a well-established history of being a colorful chat, but it was McNabb who won me over, and not just because he was wearing excellent socks. (Though he was.) Talking about the contemptible Ryan Braun, Kapler said that Braun needed to dramatically apologize to his teammate, maybe even cry a little. McNabb, with so much disdain in his voice for our current state of apology theater thatI felt a little bad for Kapler, deadpanned authoritatively, “I don’t need him to cry.” He followed this bit of sense with some real talk, saying that if he were A-Rod he absolutely would have lawyered up and denied everything, because: money. Crowd Goes Wild features another panel kicking around sports news—this one also surreptitiously moderated by a blond woman, Brit Georgie Thompson—but intermingles more canned bits. In one flat segment called “Hello My Name Is,” the panelists read out the bio and fun facts of wrongfully ignored sports personalities like the Detroit Tigers or Shelly-Anne Fraser-Pryce. In another, the show’s Twitter expert, a brunette named Katie, read aloud not-particularly-funny tweets about A-Rod, as if anyone needs help finding those. The most confounding segment was a video of the panelists giving Regis a horse, called Regis the Horse, for his birthday. That was then followed by a 10-minute segment of Regis the Horse competing in a random steeplechase race. That was then followed by a really dry interview with Oscar De La Hoya. Competence is not always created in a day. The channel’s deep-dive sports-specific programs are all more solid than Crowd, because they’re not trying to do anything nearly as complicated. The network’s college football show is moderated by yet another blonde, Erin Andrews, and the content is boilerplate. The opening segment was about Johnny Manziel and his upcoming season, with half the panelists arguing it would be a disaster and Eddie George countering that it would be, “I looked this word up: stupendous.” The show opened with Cleatus Hadokening, but otherwise the optics were atrocious. All five panelists sit around a round table, so two have their back to the camera. Did no one at FS1 ever appear in an elementary school play where they were warned against doing just this? At least on Fox Football Daily, the channel’s NFL show (first topic, RGIII’s knee) the panelists are sitting in a row in big leather chairs, like huge ex-football players and talking heads should.